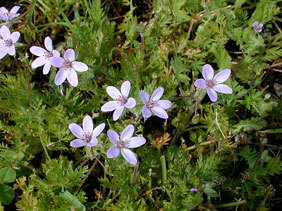 Also Called: Filaria, redstem stork's-bill, crane's-bill. Stems: Prostrate or ascending, to 20 inches long, much branched, reddish, covered with flattened, whitish hairs. Leaves: Alternate, stalked, pinnately compound; segments finely dissected, fern-like or feather-like in appearance, 3 to 7 inches long, hairy. Inflorescences: Inflorescences umbels of 2-8 flowers, on long stalks. Flowers: 5-parted, 1/4 to 1/2 inch wide; stalks 1/2 to 1 inch long; sepals 5, surfaces white hairy, veins linear, green, tips with 1-2 bristles; petals 5, slightly longer than sepals, purplish-pink to lavender. Fruits: Capsules, separating with age into 5 hairy, 1-seeded carpels that prolong into beaks .5 to 1.5 inch long; seeds oval, orange-brown. Habitat: Waste places, roadsides, lawns, and fields, most abundant in sandy or rocky soils. Forage Value: Filaree has been grown for forage in the southwest U.S. Comments: Filaree is one of the first wildflowers to bloom in the spring. It is naturalized from Europe, where it is a common weed. The carpels resemble the open beaks of birds, thus the common names stork's-bill and crane's-bill. The carpels can be a problem when entangled in sheep wool.